There’s now a peaceful calm in the part of Covington’s Westside neighborhood that once was among the city’s roughest places. Residents offer two main reasons for the improvement: dedicated community policing, and a decade-long effort by city officials to level or rehab former crime-haven buildings. Meanwhile, a surprising amount of praise goes to the small flock of chickens that quietly grazes near the site of two murders that happened within a week of 2004. 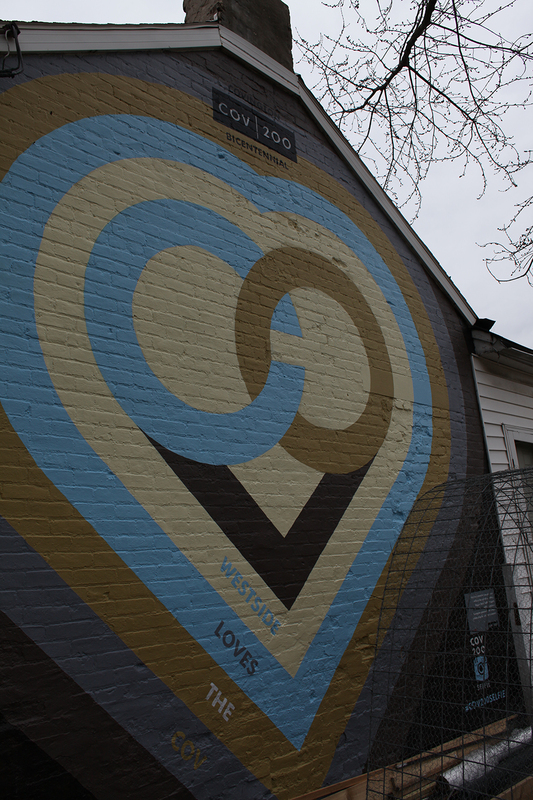 Back in the 1990s and 2000s, “You had this little pocket in the middle of the neighborhood where everyone felt unsafe,” says Rachel Hastings, director of neighborhood and housing initiatives at the Center for Great Neighborhoods of Covington. Drugs and prostitution were rampant. One man set several fires. A couple of families “were really strangling the neighborhood, and people were very afraid,” Hastings adds. After the back-to-back homicides, the Westside Action Coalition neighborhood association urged Covington to tear down the adjoining buildings where they occurred. Neighborhood leaders pointedly reminded city officials that Covington had loaned the former owners money for home repairs and the loan was not repaid. The police agreed those and other buildings should be razed. Quietly, under then-City Manager Jay Fossett, the city and non-profit Center for Great Neighborhoods started buying properties with plans to redevelop them for combined artists’ studios and housing. At the time, Fossett did his best to obscure the exact location of where the artisan housing might be, because he feared speculators would step in and boost building prices, raising them beyond the ability of artists to afford them. Covington knocked down some houses “because the criminal activity in them was so bad,” Hastings says. When a landlord who owned several dilapidated properties died, the CGN bought a couple and the city bought several more. Through the years, CGN bought properties from Covington and rehabbed them, some with city funds and others with privately raised money and grants. In all, more than two dozen properties were purchased. The Westside Action Coalition created a list of the area’s very worst properties. The center has spent about $8 million from various sources over eight years to remove the buildings that were bad teeth and restore the ones that could be salvaged. Here’s how the investment helped the area’s property values: The combined tax-assessment values of the homes before they were restored was $309,146. The combined sales prices of the same homes was $3.65 million – a 1,179 percent increase. That has encouraged others to invest in nearby properties. It took years for police to build trust in the hardened area that then was known as the Fruit Farm, apparently because an orchard once stood there. One local street is called Berry; another, Orchard. Many in the neighborhood didn’t believe police were on their side. Others feared they would endanger themselves by offering tips about criminal activity. As it turns out, today’s police chief, Michael “Spike” Jones, was the Westside’s first COPPS (Community Oriented Policing and Problem Solving) officer, and Hastings credits him with helping improve the gap between the area and police. “Because Spike was getting to know folks, he would just come after hours, and he would pass out candy and play games with the kids,” during Halloween events, Hastings says. “For residents to see officers without their uniforms on? That’s a huge deal sometimes,” Hastings says. One way residents were allowed to confidently report crime was by creating “hot-spot cards,” which allowed them to make reports anonymously through the CGN. The center’s staff helped some illiterate residents regularly in filling out the cards, which were passed to police. 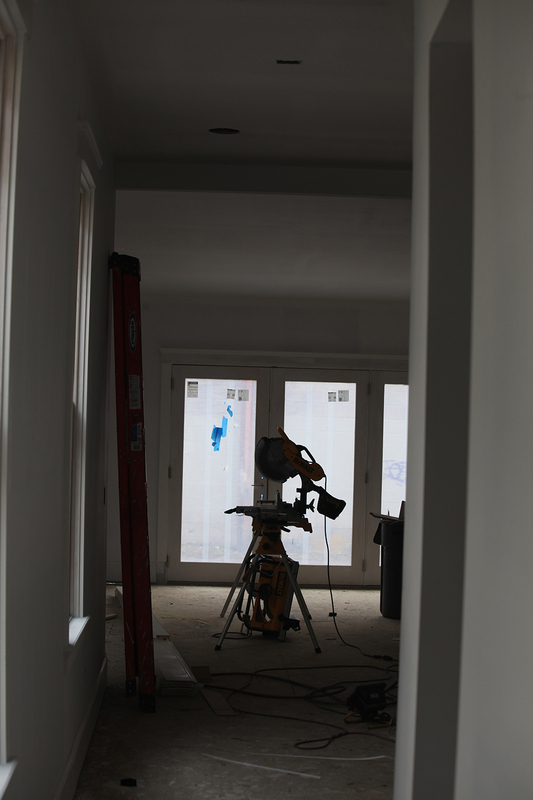 The change has been dramatic in the past decade, says nearby resident Mark Young, who recalls prostitutes breaking into a property he was renovating and smoking crack inside. “We’re running out of houses to renovate here, actually,” Young says. The turnaround was significant enough that the city last year was one of 11 cities to win awards from the MetLife Foundation and Local Initiatives Support Corporation for success in reducing crime and blight. With the award, Covington received $20,000. More than 560 police departments and community organizations had been nominated. From 2004 through 2013 there was a 50 percent drop in calls for police service from the Westside, compared with a slight increase in calls citywide. Meanwhile, arrests in the neighborhood dropped 23 percent through that period (from 146 to 113), while total charges were cut by 34 percent (250 to 166). In 2004, 54 percent of all Westside calls about suspected drug activity came from the several-block area then known as Fruit Farm. Residents today prefer to call it Orchard Park. Also in 2004, there were 51 arrests for drug possession or trafficking throughout the Westside. In 2013, that number was 18. Part of the solution in strangling prostitution and drug-dealing from the area was changing several streets in the area to one-way, to make the area more difficult to enter and leave quickly from Interstate 71/75. Also helping quell problems in the Westside – and Fruit Farm in particular – was when the Kentucky Transportation Cabinet moved ahead with the widening of 12th Street, now Martin Luther King Boulevard. 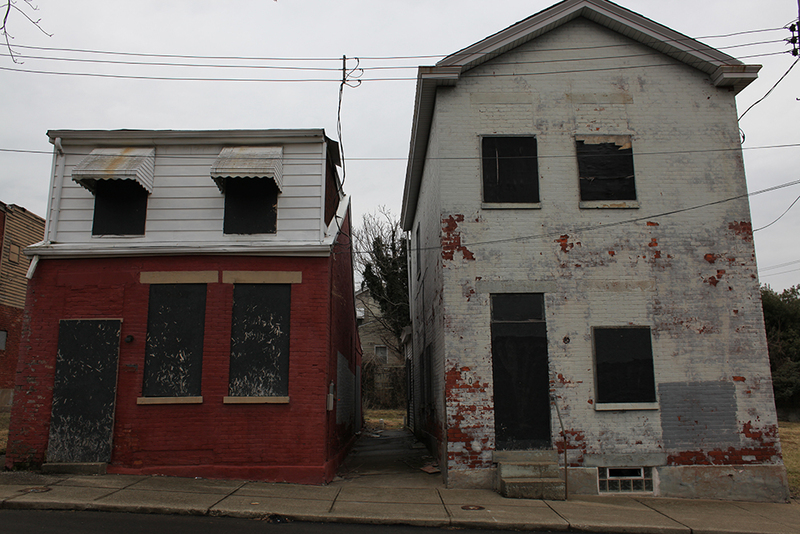 In the process the state leveled many blighted and vacant houses along 12th that had fallen into disrepair since the mid-1980s, when the widening efforts began. 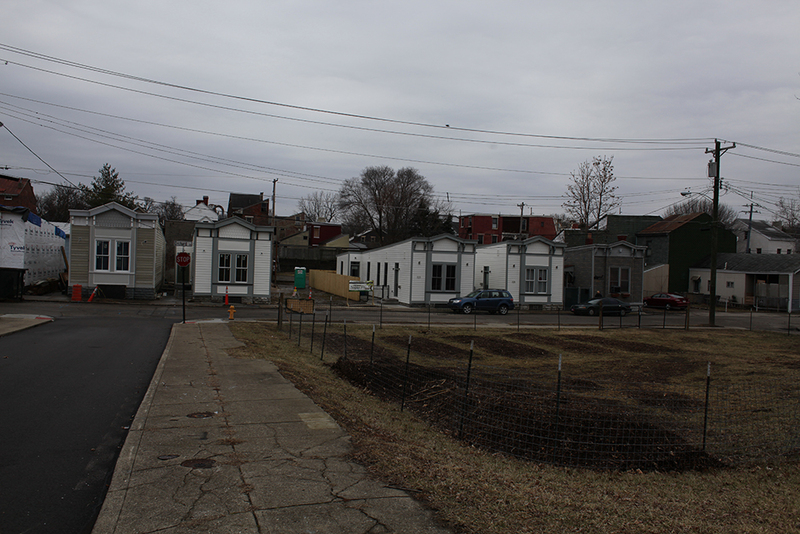 A cornerstone of the Orchard Park renaissance is a series of six adjacent shotgun wood-frame houses along Orchard Street that were built in the 1880s as living quarters for workers at a nearby quarry. 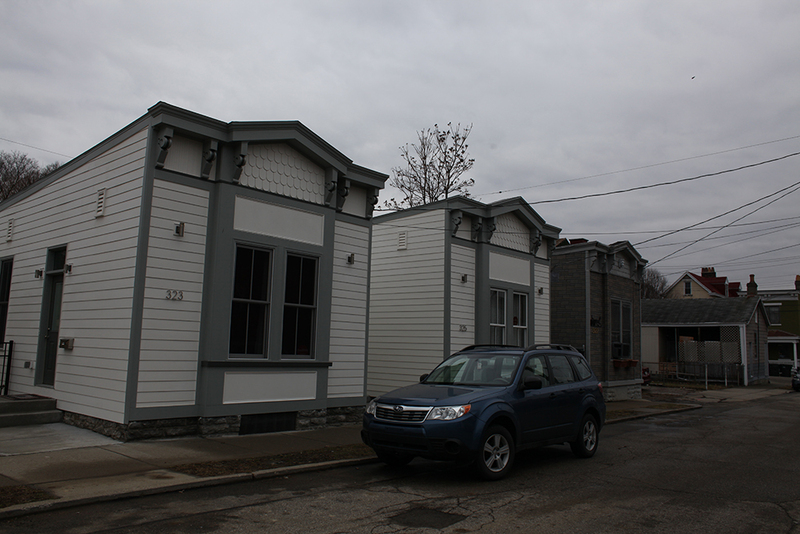 The sturdy buildings were so narrow and long that many in the neighborhood mistakenly thought they were trailers. Five of the six buildings were purchased, and renovated into single-bedroom dwellings that also include studios that receive the northern light many artists appreciate. Gone from the 1,000-1,200-square-foot homes are the several small rooms that used to fill each. Each home now has the feel of a newly-built loft space, and each has sold for about $90,000. But today, with some finished and the rest purchased as their makeovers continue, “I think they look real good,” McDonald adds. Peggy Munson, who moved in Dec. 15, likes their look, too. 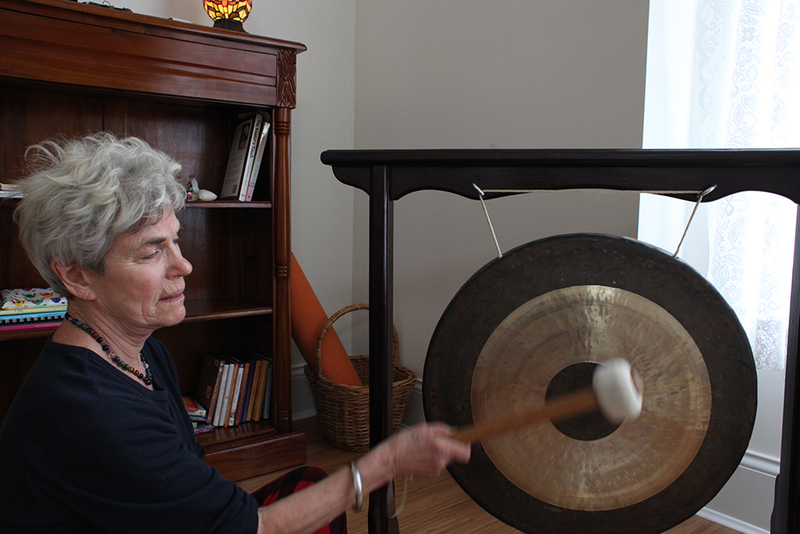 She liked hers so much, she bought it, and plans to teach yoga inside, and out on a nearby lawn in the summers. One of Munson’s neighbors is Steve Huss, who has lived in one of the shotgun houses since the mid-1980s. The retired antique seller didn’t want to sell his home, but the CGN decided they had to put a new façade on his home this spring, so it will match its beautified neighbors. Along the way, Hastings and the police increasingly worked together, especially after copper kept being stolen during construction a few years ago. In one house, even “the temporary security system got stolen,” Hastings says. Police investigated and learned a man who had been watching the construction workers’ comings and going was responsible. Police have given the CGN tips about how to build homes that don’t offer lots of hiding spaces where criminals can hide. Police also have inventoried the area’s street lighting and suggested improvements. Hastings, meanwhile, has kept police updated about the progress on renovations, and let them know when the buildings are occupied again. 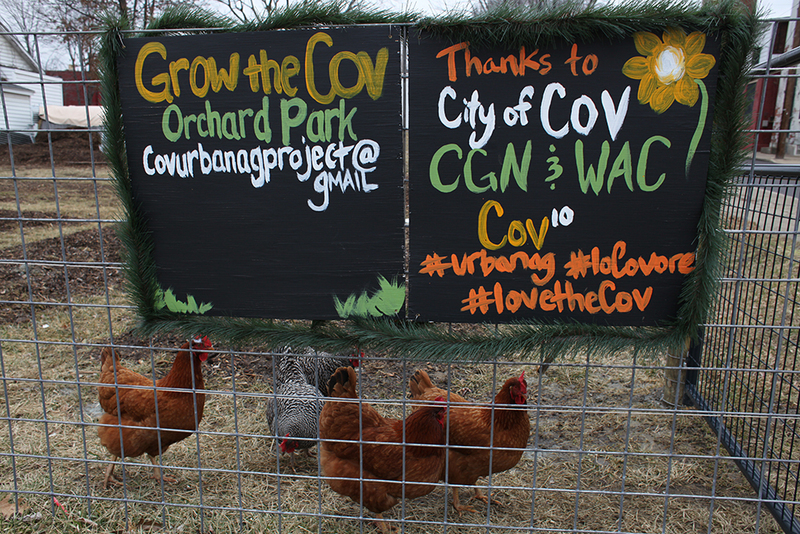 New Orchard Park resident Gus Wolf says he knew the chickens that now live on a plot of land would work to bring people of the area together. 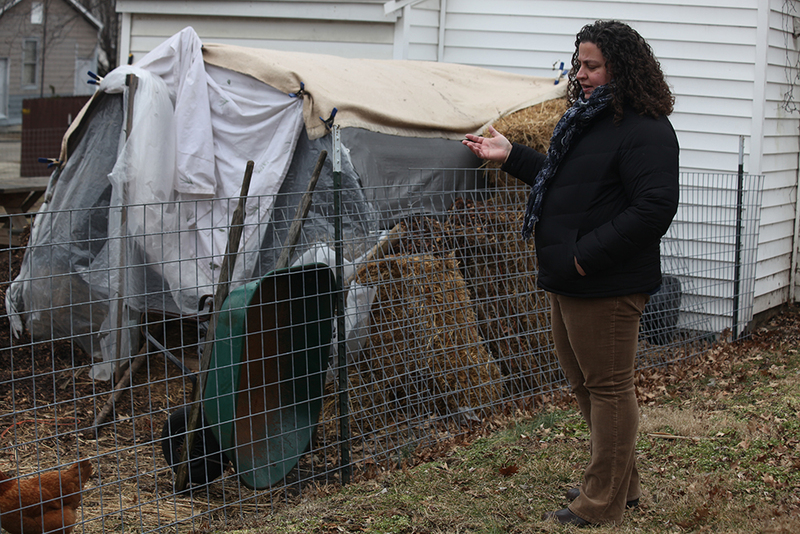 “What I knew the chickens would do is they engage people, and people get interested and start asking questions,” says Wolf, who not only lives in a home that overlooks the fenced-in chickens, but who also owns a 150-acre farm and nursery in Carroll County. Wolf runs a nursery business and last year helped run the Covington Farmers Market, which runs May through October. He also has been involved with Covington’s urban forestry board. Neighbors who didn’t speak to each other in years suddenly found lots to talk about when it came to the hens. City ordinances were changed to allow the hens, but no noisy roosters. It’s a bit magical, the way the chickens prompt people to do unexpected things: One recent afternoon, Phil and Carol Winters, who also live in the Westside, but on the opposite side of MLK Boulevard, drove by just to see the chickens , and feed them. Carol stayed in the car, but Phil did something he called “The Chicken Dance” – but with more hoola-hoopy hip-wiggling than most chicken dances. She believes some new small businesses soon will appear along MLK Boulevard to serve area residents, and motorists using the newly widened gateway to the city. Jones has continued the monthly police chief’s meetings with business owners and residents that his predecessor, Lee Russo, started several years ago, to reach out to the community. Jones, in fact, expanded it to add the city’s fire chief to the meetings. Jones says the community policing efforts in the Westside have been so successful that Covington is expanding it to include other parts of northern Covington. Policing, Jones says, can be a community-development tool: “When people feel safe coming over and shopping here and dining here, and we can make public spaces safer for folks to traverse, that’s good for us, and it’s good for the city, it’s good for everybody,” he adds. Jones’ department has been working with Larisa Sims, the assistant city manager for development, who updates police about proposed developments. Sims did not return calls for comment. Two officers now are on foot patrols, funded by community development block grant money, says Jones, who would love to expand the program to include Gateway Community & Technical College’s urban campus area. “Part of the instructions – and we hand-pick the officers that work this – is we want you out walking and we want you stopping in businesses and saying hi to folks, and getting to know who’s coming and going,” Jones says. The U.S. Department of Justice was impressed enough that it chose Covington, along with Milwaukee and Providence, R.I., to help teach other departments around the nation how to approach the work. No money came with that distinction, only national prestige for the city. Just one year later, after the writing of this article, The Catalytic Fund has suggested a proposal that would tear down four of the historic buildings (that the City of Covington was supposed to *protect* because federal funds were used to buy these properties). The proposed development would be to install ten single-family townhomes and a 20 space parking lot over Orchard Park. This proposal will be presented to the public on March 1st, 2016 at the Center for Great Neighborhoods at 1650 Russell Street at 6:30 PM. I think this deserves a follow up story, don’t you?